I’d been meaning to return to Sunset Buttress on Lochnagar for years. I first climbed it in 1994 when winter climbing in the Southern Sector was not very fashionable. Rick Allen and I made an ascent of the original summer line that March, and the following December, Brian Findlay and I climbed the offwidth crack slicing the left side of the buttress. 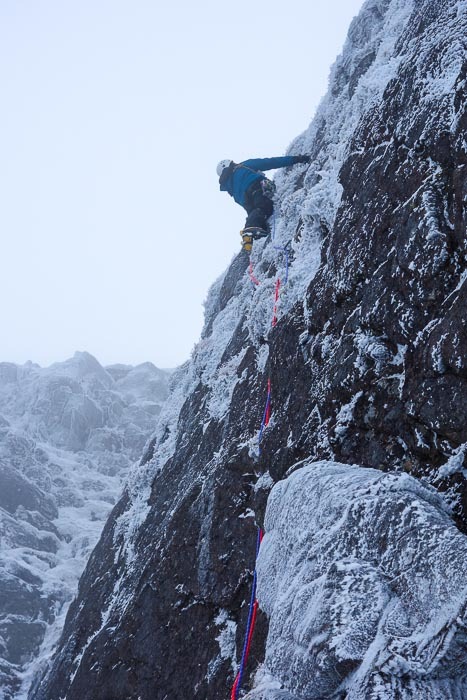 These routes were originally called Quick Dash Buttress (now Sunset Buttress) and Quick Dash Crack because they were climbed on ‘write off’ days when warm fronts were racing across Scotland decimating winter climbing conditions in their wake. But Lochnagar’s situation on the eastern side of the country can allow you a couple of hour’s grace before the ravages of a forecast thaw if you are really quick. I remember on both occasions we made very early starts and were coiling the ropes at 10am on the plateau at the top of the climbs with our backs to the gale as wet snow turned to rain. On January 18, Forrest Templeton and I had no forecast thaw to worry about. In fact it was quite the reverse because a fierce frost the night before meant the process of gearing up in the cold was rather a slow affair, but the upside was perfectly frozen turf, beautifully hoared white from the snowfall two days before. I knew there was a line of turf running straight up the left wall of the buttress (overlooking the gully of Iffy). New Dawn (V,5) gave two absorbing pitches (read long run outs) before finishing up the final upper ridge shared with the other routes. After bumping into James Richardson and Andy Munro fresh from their ascent of Goldilocks in main corrie, we climbed the rib between the unnamed Grade I/II gully to the right of Sunset Boulevard and the impressive slot of The Pod situated on the right side of the buttress. Twilight Hour (IV,6) involved an unlikely sharp arête with hidden positive holds at half-height before easier ground on the upper crest led to the top. This entry was posted in New Routes and tagged Forrest Templeton, Lochnagar, Simon Richardson. Bookmark the permalink.